Are Student Loans preventing you from pursuing teaching English abroad? Learn how you can overcome this obstacle and see the world as a paid English teacher. Yes — With total outstanding student debt surpassing the $1 trillion mark, the majority of college graduates today finance their education through borrowing and debt in the form of student loans. You may think, how can I get TEFL certified and teach English abroad when I have to pay my student loans? While student loans are concern for many there are still options that will enable you to enjoy the opportunity of a lifetime to travel the world and work overseas as an English teacher. Don't let student loans be a deterrent or excuse not to teach abroad or do anything in life! Newsflash to new college graduates: you will be paying these loans for 10 to 20 years. Later in life you will have a car loan, you will have a mortgage loan, you will always have bills to pay. Will it matter in the long run if you pay off your student debt when you are 32 or years old rather than 31? No. You just need a practical strategy to make things happen in life. Here are a few suggestions that our TEFL graduates do every year. Option 1: Defer your loans. Deferment is an agreement between the student and the loan provider whereby the student may postpone repaying the loan for a designated amount of time. You may be responsible for paying the accrued interest during the deferment period, but you are not required to pay the interest during the deferment period. To learn more about deferment, please contact the entity that services your loan. Note that deferring your student loans will not affect your credit rating and will not hamper you from obtaining student loans in the future. Typically student loans come in 2 forms, subsidized and unsubsidized, know what you have and make a plan. Subsidized are guaranteed student loans (GSL) through the federal government, these can be deferred with little paperwork. Unsubsidized are extra loans that probably can not be deferred (but check with your loan provider). Now is the time to look at your paperwork and figure out exactly what you have and can make a smart plan going forward. Excuse # 1 to avoid: I don't want to pay that extra interest for delaying my payment a year. Reality check: When you make money later in life, pay the interest off early. You have either time or money in life, now is the time, you will come up with the interest money later. This could be anywhere from $ 10 to $ 50 a month in interest (depending on your loan). In the big picture you should ask: is this really what will hold you back from living abroad? Are you making an emotional decision or practical decision based on simple math? Excuse # 2 to avoid: I don't want to defer my loans. Reality check: Ok, why not? That's why the government gives you a free pass on deferment, pay the interest, they don't care, the banks made a little extra money and you kept your credit rating perfect. If you do not qualify for a deferment, your loan servicer may be able to grant you a forbearance whereby you may be able to stop making payments or reduce your payments for up to 12 months. However, interest will continue to accrue on your loan(s). As with a deferment, you should submit your request for forbearance to the organization that services your loan. For more information on deferment and forbearance options, visit the US Department of Education’s Federal Student Aid website. The rules of the game were meant to be used, take advantage of them. By the time now as you will not have this time in your life later (ask anyone with a child and mortgage and career if they would take back a year of their life when they didn't have responsibilities). Ok, if this step doesn't fit your taste, move on to the next strategy, make money to pay for loans. Option 3 - Teach English abroad in a country where you will earn enough to be able to make your loan payments. Choose a high paying country. How would you like to be earn enough money to pay off a significant portion of your student loan(s) while teaching in another country and enjoying the time of your life experiencing living in a foreign country and traveling to world? In Latin America and Europe, English teachers typically break even financially, but in Asia and the Persian Gulf nations of the Middle East, most English teachers make enough to save 30%-50% of their salary after expenses. Step A: Figure out how much money per month you need to pay on your loans (i.e. $ 350 a month). Step B: Go teach in a country that you can SAVE that amount (or more) every month. Have the time of your life, put money in the bank and don't sit at home complaining that you "can't go anywhere because you have student loans." Step C: If you teach in a country for a year that makes you a extra money, put some in the bank for next year if you want to teach in a country that doesn't offer salaries that are as high. Here are some high paying countries where new college graduates can teach English and save extra money after expenses. English teachers who work in the oil rich nations of the Middle East like Saudi Arabia, Qatar and the U.A.E. can save even more money. One question to ask yourself is, how much money will I be able to save working an entry-level position right out of college? Why not see the world before you get tied down with a career and a mortgage and at the same time pay off a significant portion of your school loans? Excuse # 3 to avoid: I only want to go to a certain country, and can't afford it. You don't always get what you want immediately and there is an entire world out there worth exploring. Go work in a country and make a stack of extra money year one (instead of working at Dairy Queen, the local bar, boring office job, insert non-exciting wage job here) and year 2 go to your desired country with money in the bank to pay off your loans. You will probably love the first country so much (and now have all new friends) that you will stay another year, it happens all the time. A) Take an online TEFL course instead of a 4 week in person course. Taking an 11 week part-time online TEFL certification class instead of an onsite course will not only save you money on tuition, but it will also save you money since you can take the class while you are still at home. You'll save money since you won't need to take a month off to fly to a new location and you won’t need to pay for housing while you take the class. Additionally, the online class is part –time so you can earn your TEFL certification while you are still working and can continue to save money for your start-up costs. The price difference between an online course and a four-week course (tuition, housing, food) is typically $ 1,500 - $ 1,800. B) Line up a job in advance. Another way to save money is to seek opportunities in countries where you can interview in advance so that you have a job waiting for you when you depart for your teaching destination. Lining up a job in advance cuts down start-up costs required to support yourself for the time it would take to find a job once you are on the ground in the country where you want to teach (typically 1 to 2 weeks living expenses). While schools in many countries still prefer face-to-face interviews on location, schools in other regions will interview in advance over the phone, through email, and through Skype. It is common practice for teachers to line up jobs in advance in many nations in Asia with very strong markets for English teachers such as China, Japan and South Korea. It is also common for schools in the Middle East to interview in advance, and in some other countries like Turkey, Russia, and Mexico. For more information about where you can interview and get hired in advance, please read "Where can I interview in advance for jobs teaching English abroad?" C) Go to a country where flights and housing is free: China and South Korea have so many positions available the schools are enticing you with start-up expenses waived such as free airfare and free housing. You can get abroad and secure until your first paycheck with $ 600-800. In Russia and Turkey, many teachers (though not all) receive at least an extra stipend to offset airfare and/or housing costs. Approximately 50% of those teaching English abroad under 30 have student loans, they all were in your shoes, had the same concerns and made a strategy to go overseas. D) Wherever You Want to Teach, Do Not Neglect Opportunities to Teach English Online. 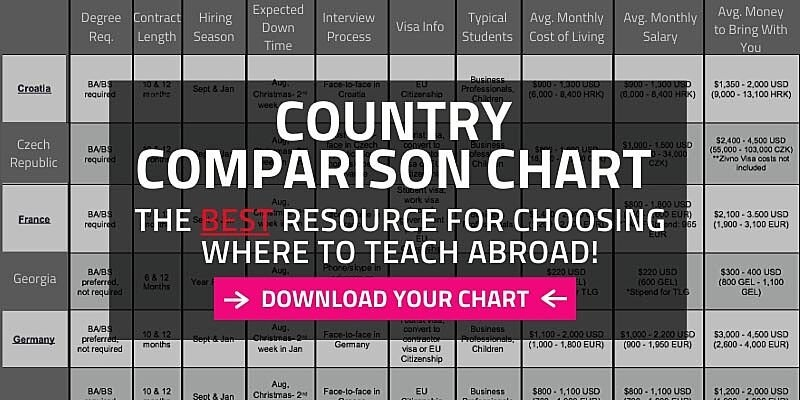 Depending on where you decide to teach abroad and your personal circumstances, one option you want to at least consider no matter where you head abroad is teaching English online. For one thing, you can start making money right away from anywhere in the world. This means you can start earning income teaching online from home to save on start-up costs before you actually head abroad. Teaching English online offers flexibility. - You can work from anywhere - As long as you have a high quality & reliable Internet connection, you can literally make money teaching English online. - You can teach English online part-time or full-time. English teachers all over the world teach online to make extra money on the side of their full- or part-time job at a local school. Other English teachers teach English online full-time, which offers more flexibility in terms of begin able to move from location to location at will. Don't let student loans become an obstacle to pursuing your dream of living and traveling abroad! With good planning, you can make it happen.